This is one soft and cuddly Cloud Hand Puppet. Made from that microfiber and feels so good when you rub it. It’s mostly just that soft material with stuffing inside. The mouth is made from paper board covered in material. An inner sleeve is inside to create a channel for the hand within the stuffing. The eyes are made from craft foam. Just below the mouth, there is a white plastic nozzle attached. From the nozzle, runs a rubber tube that goes to a rubber bulb bladder. Remove the bulb, fill it full of water, replace it, and put it inside the puppet. 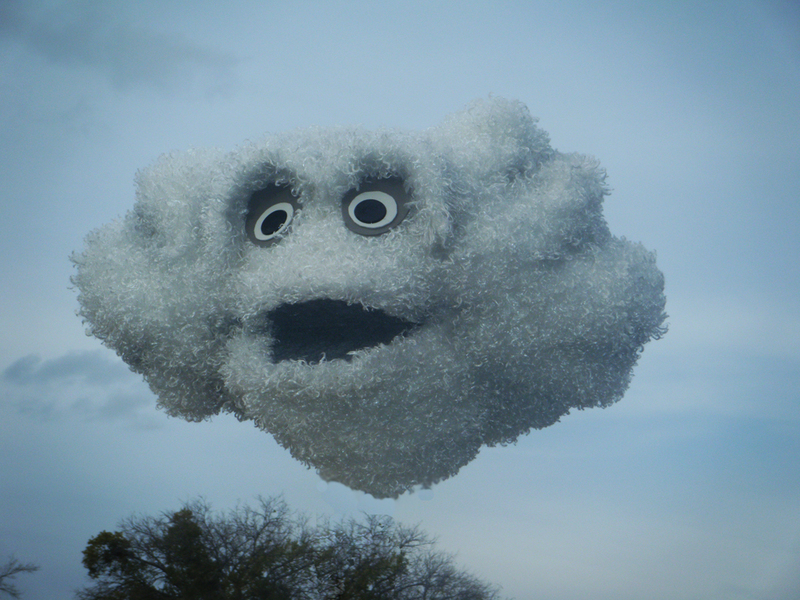 When you want, squeeze the bulb and the cloud puppet will rain on the audience. Very very fun.